Posted 10:55 am by Heather Iannucci & filed under Object of the Week. 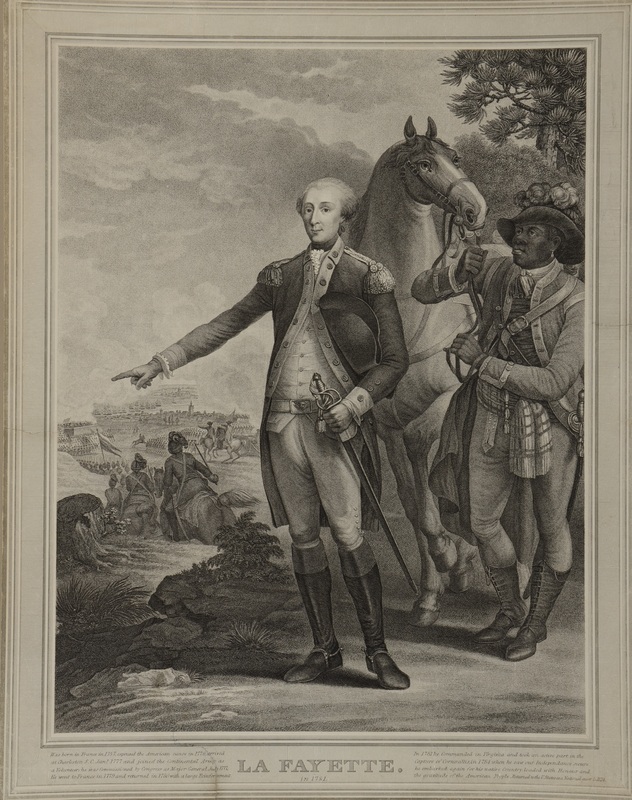 This print of the Marquis de Lafayette was engraved by Noel Le Mire (1724-1800) after a painting by Jean Baptiste le Paon (1736-1785). It depicts the famous French General with his aide, and spy, James Armistead. Armistead was a key operative for Lafayette during the later years of the Revolution, working as a double agent. Posing as a runaway slave, Armistead first joined the British camp of turncoat Benedict Arnold, and later General Cornwallis. He gained their trust, to the point where they would speak openly about strategy in front of him, which he documented in written reports and sent to the Americans through Lafayette. The intelligence gathered by James Armistead was useful in the American victory at Yorktown. He was emancipated in January of 1787, with the help of testimony by General Lafayette about his exceptional service during the American Revolution.